Remember, too, if anything Hillary says, which is recorded or transcribed, is false, then it can be used as evidence against her -- thanks to a hearsay exception. Lying under oath is not the only way to use 'false exculpatory statements' as evidence of consciousness of guilt. By the way, I looked up those hearsay exception rules after Gowdy questioned Comey at his oversight hearing. But I was not confident that Gowdy got that point across. Hillary's public and recorded false exculpatory statements are admissible as evidence of intent. Hillary needs to be grilled, ON THE PUBLIC RECORD, about all of this. Tomorrow, at the debate, would be a perfect time to shoot a few questions to Hillary about this. In fact, it's the only opportunity to try to get her on record with anything BEFORE Combetta's hearing on Tuesday. Trump better confront her with this because the moderator won't. I mean, I doubt Combetta will answer any questions, on Tuesday, but if he can muster any sense of self-preservation, he will insist to his lawyers that he show up, tell them he doesn't want to risk contempt charges, promise to plead the 5th, and then spill his guts completely. If he hasn't left this option available to himself...then I think he has seriously underestimated the Clintons. They will not allow him to be a threat four years from now. I heard about this updates today morning. Anyway i think it is good to conjoining both of them. Let us wait and see the new changes. If you need to control who gets to email the vip, just set up stringent spam filtering where only whitelisted people or people the vip has emailed are allowed. EDIT: Apparently I was involved in a Hilary thing. Sadly I completely mis-understood the OP's request and provided incorrect information. Thanks for the gold though! When was this edited in? 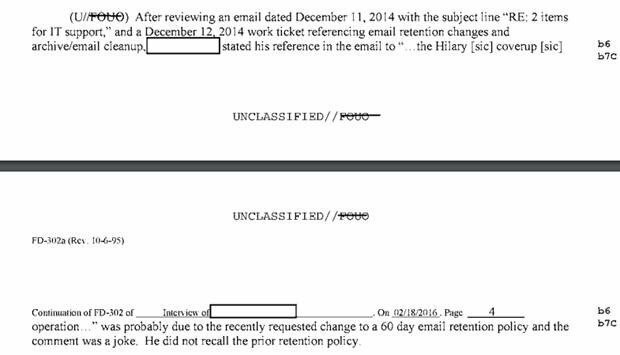 The newly-released (and name-redacted) FBI document from a Clinton I.T....referring to the "Hilary coverup"---ALSO spells 'Hilary' with ONE 'L'. He is very brazen or knows that NO ONE will be called to answer for these things under the law. I bet it is the latter. A very interesting and astute observation. Will be looking for any follow up. For any interested, I have a thread up about the Oversight Committee meeting regarding Comey being brought in. It defies logic and the law that she faces no consequences for jeopardizing national security. It also appears that Secretary Clinton may have perjured herself and made false statements to Congress under oath. I’ve called on the Justice Department to investigate her for perjury and am interested to hear from Director Comey on the matter.